Kolkata Knight Riders (KKR) officially launched their new jersey on Sunday, April 1. They come back with their old friend, Nokia as the principal sponsors of KKR. The logo of brand NOKIA emblazoned on the front of the KKR jersey uniform. 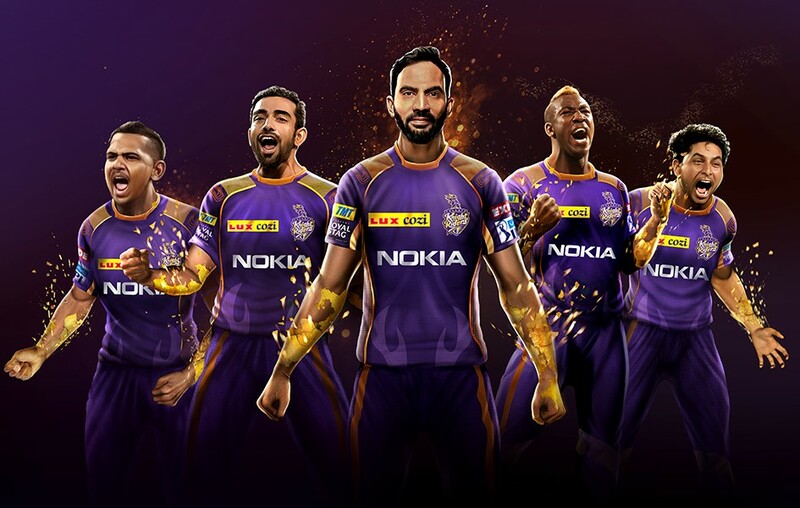 Two-time IPL champions started their IPL career with the primary brand of Nokia until 2014, which was the year they lastly won IPL title. Later, Gionee sponsored for three years from 2015 to 2017. Again, their jersey emblazoned with the name of Nokia in front and ‘Lux Cozi’ in the chest. Jio continuing its back shirt sponsor for the second year after ‘Sansui’. The key player of 2018 Nidahas Trophy final match, Dinesh Karthik (DK) replaced the Gautam Gambhir’s captaincy position in the KKR as Gambhir appointed at captain for the new side, DD. In the event of KKR jersey launch, Karthik presented the new jersey with their coach Jacques Kallis and colleagues. Unfortunately, the owner of KKR was not there in the event. But, later he appeared in a video with KKR new jersey. The new captain of the team said that “Being a leader of the team, the management will expect from me the same. I’m aware of the expectations. Yes, there would be pressure. As a captain, you’re expected to at least go to the playoffs, that’s the least anybody can expect. I think I’m at a stage where I can handle it and get the best out of the team”. The First 100 buyers who all purchased from the official store will get a chance to meet their favorite KKR players or to win free KKR tickets. In this official KKR store, fans can buy Jersey, T-shirts for men and women, caps, and backpacks. Pre-order official Replica Jersey 2018 at Rs. 2,499.00. It will be delivered by 8th April. Fill the form with your name, designation, company, Phone number, email id, and then submit. The first game of KKR will be with Royal Challengers Bangalore in this 11th IPL tournament on 8th April, a day after the first game and opening of IPL 2018.